Contest Results are up here. Lots of great photos pouring in from the 15th Annual East Coast Wahine Champs!! Photos by Ed Potter, NC Surf Photo, Thanks Ed! Check out our event page on Facebook. Just search under 15th Annual East Coast Wahine Champs and it should come right up! 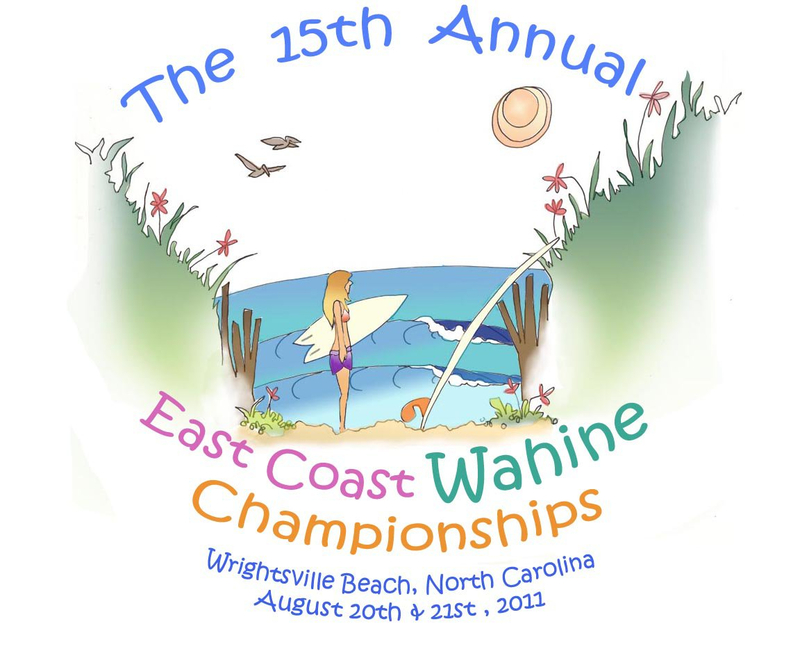 In 2011 the East Coast Wahines will be celebrating 15 years of women’s surfing! Please join us August 20-21 for two days of competition. Divisions will include shortboard, longboard, bodyboard, and novice- all ages, from groms to goddesses! Exciting news! The East Coast Wahines have partnered with Sweetwater Surf Shop for 2011. Jess Dinardo and Carleigh Sion will be directing the event. The contest will be held in the heart of Wrightsville Beach- the downtown business district and one of the best known surf breaks around, Columbia Street. Wrightsville Beach, NC—Southeastern North Carolina is gearing up for the largest women’s surfing contest on the right coast- the East Coast Wahine Championships. Held every August in Wrightsville Beach, the ECWC encourages female surfers of all ages and abilities to join in the fun. This year’s event is scheduled for August 20-21st. Nearly 200 surfers will participate in shortboard, longboard, bodyboard, and novice divisions. New in 2011, The East Coast Wahines are partnering with Sweetwater Surf Shop, the premiere surf shop in downtown Wrightsville Beach. The contest site has been relocated to Columbia Street because of its vicinity to local downtown Wrightsville Beach businesses, restaurants, and amenities. Sweetwater Surf Shop employees and previous ECWC contestants, Jess Dinardo and Carleigh Sion, will be co-directing the event. The East Coast Wahine Championships was the first all female amateur surfing contest on the east coast. The event began in 1997 as a tribute to a late friend and as a way to give women the spotlight in the surf. The event has since grown steadily receiving national coverage and industry sponsors. Wrightsville Beach, North Carolina has been named one of the Top 10 surfing towns and UNCW has been named one of the top 10 surfing colleges in the nation by Surfer Magazine. Sweetwater Surf Shop has been a part of the Wrightsville Beach community since 1976. The shop carries over 375 surfboards and has the largest selection of ladies apparel and wetsuits on the beach. Sweetwater also hosts one of the largest and successful Pro-Am events on the East Coast, the Reef Sweetwater Pro-Am. In 2010, the Sweetwater Surf Team won the Oakley Surf Shop Challenge National Championship and hope to repeat in 2011. Sweetwater would like to invite local and industry sponsors to be a part of this festival celebrating women’s surfing. Hey!!! The SC Governor’s Cup is the same weekend!! Oh No!! Are the dates in GOLD? So many SC wahines will miss out on the BEST, most FUN contest…any chance this will change? ?